It’s been over a month since the announcement by the LIGO team that they made the first ever direct observation of gravitational waves in history. The following is a concise list of problems associated with this claim, much of which has been summarized from my original post a couple of weeks ago. The Advanced LIGO experiment did not follow the scientific method, one of the fundamental tenants of which is that test results should be verifiable and repeatable. Italy’s VIRGO interferometer was being upgraded and Germany’s GEO600 interferometer was not in observational mode at the time of this single detection by the LIGO instruments so there is no outside verification of the detected signal. This lack of verification and additional results should in and of itself disqualify this singular observation from being claimed as a real discovery. Decades of research and billions of dollars have been spent trying to detect gravitational waves. The researchers were under tremendous pressure to come up with at least one result, especially with the 100th anniversary of Einstein’s original prediction approaching. After the last set of upgrades some of the researchers were quite certain LIGO would find gravitational waves or noted that it would be very surprising if it did not. Such biased predilections were obviously going to eventually lead to only one possible outcome. Careful review of the LIGO team’s published paper in the Physical Review Letters reveals the extent of the biasness and the desperation to make the observations fit their theories. The paper gives a range of figures for the distance and sizes of the two black holes that are supposedly the source of the gravitational waves. The margin of error for these ranges is over 40% and almost 15% respectively. Even the signal to waveform match from which those ranges are calculated only has an accuracy of 90% using two independent matching techniques. In any other context such margins would be considered educated guesses, not the basis for such a monumental discovery claim. The paper describes the detectors’ components and how they are protected against external environmental influences and noise. It is interesting to note that “all components other than the laser source are mounted on vibration isolation stages in ultrahigh vacuum”. It is not explained how the laser sources are isolated or if they are even isolated at all. The paper also mentions that the mirrors used in the detectors are isolated from seismic and thermal noise by being suspended from a “quadruple-pendulum system supported by an active seismic isolation platform” using fused silica fibers. It is not explained how or even if the mirrors are isolated from other forms of electromagnetic radiation and external influences. The effectiveness of the LIGO detectors depends primarily upon how accurately its mirrors can reflect the laser beams shined at them. Although the mirrors were polished to extremely fine tolerances of almost one angstrom (1Å) the remaining imperfections are still over a billion times larger than the predicted size of gravitational waves themselves (only one-ten-thousandth the diameter of a proton). It has been argued that because these imperfections are a constant and not a variable they are accounted for in the observations. However, because these imperfections are randomly distributed across the mirrors’ surfaces it is unlikely they can be accurately excluded from the measurements. The published paper mentioned that each observatory site is equipped with an array of sensors to monitor “environmental disturbances and their influence on the detectors”. Nowhere is there any indication that any other sensors outside of the detector sites were consulted, even those operated by any of the many institutions that are part of the LIGO collaboration. 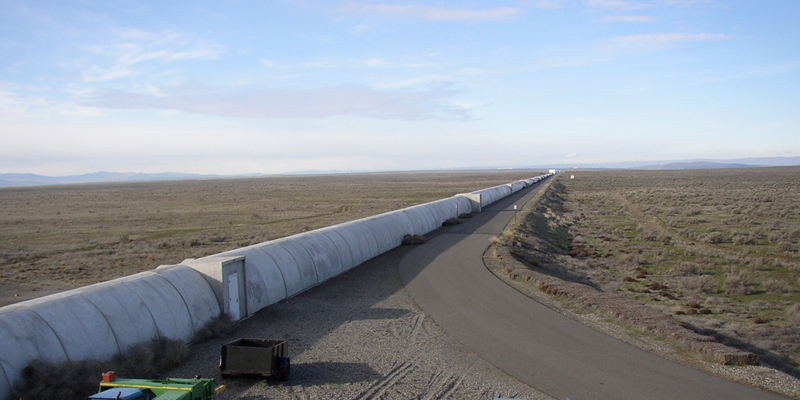 The LIGO detectors were built to detect gravitational waves that travel perpendicular to them, stretching and compressing the lengths of their long L-shaped arms. However the time difference between the two signals was less than 7 milliseconds. This means the waves would have had to travel more parallel to the detectors which would have made them significantly more difficult to detect. Despite all the elaborate noise isolation features, quite a significant amount still made it through to the detectors. The paper describes the noise as “non-stationary and non-Gaussian” or in other words, random. A variety of techniques were implemented to attempt to clean up the noise, including the use of band-pass and band-reject filters. After filtering the noise the best they could, the researchers looked for any type of strong waveform patterns with “durations up to a few seconds” buried in the random noise. They then compared these strong signals to “approximately 250,000 template waveforms” until they found a match in both detectors within 10 milliseconds of each other. That’s akin to waiting for one of a quarter million sequences of numbers to appear almost simultaneously between two continually running random number generators. In fact, the LIGO team’s own signal processing tutorial clearly shows that after all the filtering and processing it really is just a matter of complex numerical pattern matching. The probability statistics presented in the paper are meaningless in light of this skewed method of research. Given enough time with that many acceptable patterns, an eventual match was guaranteed. The LIGO team converted the visible pulsation of light that was observed into an audible “chirp” in an attempt to reinforce their “ring-down” description of the supposedly merging black holes and the resulting gravitational wave generation. This has misled the public into believing, and the media and many so-called science sites into reporting, that an actual sound was detected as part of the LIGO team’s discovery. This was a complete misdirection on the part of the LIGO team in an effort to foster agreement with their findings. The original detection range given for Advanced LIGO at the time of its official start was 225 million light-years, more than three times the range of LIGO’s last run in 2010. But the LIGO team has determined that the gravitational waves they detected were at a distance of 1.3 billion light-years or almost 6 times the detection range of the instruments. So far no explanation has been given for how these objects were detected so far outside of LIGO’s stated range. The gravitational waves were detected four days before Advanced LIGO officially started observations, while the instruments were still in engineering mode. No significant signal was detected during the almost four months of Advanced LIGO’s first official observations. The LIGO team originally predicted they would see several sets of gravitational waves per year with Advanced LIGO. But after operating the upgraded detectors from September 18, 2015 until January 16, 2016 – a period of almost four months – the only significant signal observed was the single one three days before official observations began. It has since been announced that the LIGO team is running the data through Einstein@Home in an attempt to find subsequent signals in the overwhelming noise observed. This new methodology will almost certainly produce results, but their statistical significance will be substantially less than the already highly questionable initial discovery. Almost all subsequent observations of the area of the black holes’ supposed merger have so far detected no corresponding object in any electromagnetic wavelength. The only noticeable exception is a Gamma Ray Burst (GRB) reportedly observed by the orbiting Fermi Gamma-Ray Space Telescope. However, if this observation proves to be true it would contradict the currently accepted models of the black holes and their merger. These are legitimate problems that should be addressed before more questionable discovery claims are made, additional funds are granted, or any prizes are awarded. Please feel free to use this list to expand your own discussions and help bring these problems to light. 17 comments on "Problems with the LIGO gravitational wave discovery"
Shannon…Personal thanks to you for being a Truth seeker. The experiment was pseudo science at its worst…a sham from the increasingly fantastical world of Scientism. Your questions and observations should be heard. This is a sad case and shows the deplorable state of Cosmological Science and Theoretical Physics today. Keep up the great work! I am a Sci Fi and Fantasy writer, but like Jules Verne…I want to know the truth about today’s science! You are welcome! This sort of thing has been happening for a long time but when public funds continue to be wasted the people have the right to know. The harsh reality is that most people have little concern for implausible cosmological models or pseudoscience but they are concerned about where their tax money ends up. And who knows? Maybe a few will learn something new along the way. Interesting posting. I like your style and content, but your claims, as stated in this post, sound more like an opinion. So, are you able to provide references to support your statements? I am especially intrigued by the assertion that their detection was made before their experiment actually started. I may have missed that in their paper. And I have to admit, I didn’t read all of the other papers that they’ve provided on their website. You’ve asked some very good question and make several good points and observations. I am definitely going to give additional thought to your questions and observations. I espeically like how you’ve put the puzzle pieces together regarding the September 14 versus September 18 dates. That question alone is one that must be investigated and answered! I contacted one of the LIGO researchers to understand the distinction between an engineering and an observation run. Based on his reply, I don’t think the distinction between engineering and observation runs is significant. The distinction is based on an arbitrary date/time. The device was up, running, and collecting data. They could have selected an earlier date to begin their “official” observations. A way of thinking of this in real terms is to imagine that you are asked to analyze engine telemetry to evaluate the performance of a race car at racing speeds. If it is Formula One racing, then you cannot analyze anything before the start signal, and probably not for a few seconds after that signal, because F1 races start with the cars stationary. For Indy Car racing the cars are already at race speeds when they get the starting flag, so you would have telemetry for the car, preceding the race start, that is real and useful. So, LIGO is more like Indy Car racing. I have shown in my work that relativity is wrong, so I do not agree that LIGO is confirmation of Einstein’s work. I agree that there are more questions than answers and I like your post for the thoughtful questions it raises. Maybe it is just coincidental that the only strong signal detected occurred when it did. That still leaves over a dozen other issues that LIGO should address before Nobel Prizes start being handed out. I am curious what the LIGO researcher you contacted would have to say about those. In addition to the points raised above by the Author, there are the fundamental problems with the theories employed by the LIGO-Virgo Collaborations, not the least of which is that their theory of black holes violates the rules of pure mathematics and is therefore false. I have read your paper and although admittedly some of the math is above my understanding I think you make some very good points. Of course I particularly like your mention of the cost to taxpayers and the comparison to the LHC. I initially researched the discovery claim to see if there might be a plasma or electrical/magnetic based explanation for the signal detected. It was during this research that I discovered the multitude of problems with the experiment itself and the tremendous amount of time and money that has been wasted on it. So I decided to focus on those aspects in the hopes that it would draw more attention from the public and provide an opportunity to expose more people to the fallacy of modern mainstream cosmological thinking and experimentation. Hi Shannon, I wrote a blog entry on LIGO that references this post on your site. So, I want to share it with you in case you’re interested in reading it. I first met John Baez 35 years ago, as a classmate in an Advanced Logic course at Princeton University. Definitely a very intelligent and nice guy (cousin of Joan Baez), but when I asked him whether LIGO wasn’t potentially just premature and jumping to conclusions, he blocked my subscription to his website on Google Plus. I never said anything rude to him, and treated him as a friend, but he was apparently so offended that I wanted to doubt the results (after BICEP and OPERA) that he couldn’t tolerate me being allowed to read or post on his site. I wrote him a personal email asking what I had done wrong, but he wouldn’t reply. This kind of behavior really leads me to wonder if LIGO isn’t a deliberate fraud that Scientists are trying to get away with. I don’t see justification for the rudeness. LIGO is without a doubt a fraud perpetrated on an unsuspecting public. And John Baez is in on the fraud too. He knows that spacetime is a block universe in which nothing happens. He’s known about this for years. He and I discussed it on usenet in way back in the 90s. Relativists who have been around long enough are aware of this nasty and extremely inconvenient little truth. It essentially kills the Einsteinian fairy tale dead. Sir Karl Popper (and others) pointed this out to them many years ago (see Conjectures and Refutations). So, if nothing can move in spacetime, how did gravitational waves get a free pass, pray tell? We, the taxpayers, are being ripped off. “Spacetime” formulation of objective reality by Minowski and Einstein has little or no philosophical basis. It is a geometrical construct based on axioms that has no material basis and has no concern for “matter” and “motion”. It seems to me that IF the detectors did wiggle at the same time, it proves Nothing about gravitational waves. It only might prove that something made them wiggle at the same time. Perhaps internal to Earth..